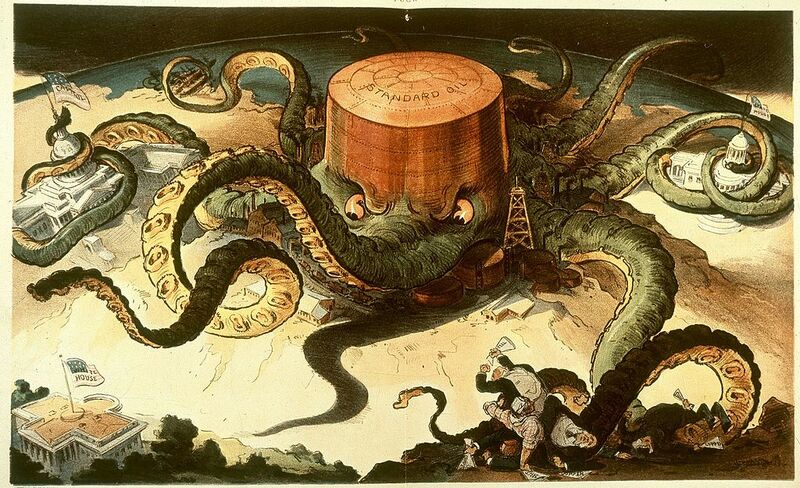 So, there's this story going around the econosphere, which says that the economy is being throttled by market power. I've sort of bought into this story. It certainly seems to be getting a lot of attention from top economists. Autor, Dorn, Katz, Patterson and van Reenen have blamed industrial concentration for the fall in labor's share of income. Now there's a new paper out by De Loecker and Eeckhout blaming monopoly power for much more than that - lower wages, lower labor force participation, slower migration, and slow GDP growth. The paper is getting plenty of attention. That's a big set of allegations. Everyone knows that the U.S. economy has been looking anemic since the turn of the century, and now a growing chorus of papers by well-respected people is claiming that we've found the culprit. Monopoly power could potentially become Public Enemy #1 for economists, the way taxes and unions were in the 70s, and antitrust could become the new silver bullet policy. Tyler's post really made me think. It raises some important issues and caveats. But ultimately I don't think it does that much to derail the Market Power Story. Here are some of my my thoughts on Tyler's points. There are two ways these mark-ups go could up: first there may be more outright monopoly, second there may be more monopolistic competition, with high mark-ups but also high fixed costs, and firms earning close to zero profits....Consider my local Chinese restaurant. Maybe the fixed cost of a restaurant has gone up, due to rising rents and the need to invest in information technology. That can mean higher fixed costs, but still a positive mark-up at the margin. First of all, and most importantly, monopolistic competition is perfectly consistent with the Market Power Story. Monopolistic competition in general does not produce an efficient outcome. Though monopolistic competition doesn't generate long-term profits like monopoly does, it does generate deadweight losses. This is true even when market power comes from product differentiation, as in the typical Dixit-Stiglitz formulation. Monopolistic competition does involve market power, so could also explain the drop in labor share, wages, etc. So this objection of Tyler's doesn't really go against the Market Power Story, which was always about monopolistic competition rather than outright monopoly. What about markups vs. profits? In general, Tyler is right - higher markups could indicate higher fixed costs rather than higher profit margins. But what would these fixed costs be? Tyler suggests rent, but that is a variable cost, not a fixed cost. He also suggests information technology costs -- buying computers for your office, software for the computers, point-of-sale tech, etc. But advances in IT seem just as likely to reduce fixed costs as to raise them. Typewriters cost as much in the 60s as computers do now, but computers can do infinitely more. So much business can be done on the internet, using freely available tools like Google Sheets and Google Docs and free chat apps for workplace communications. Internet outsourcing also dramatically lowers fixed costs by turning them into variable costs. I'm open to the idea that fixed costs have increased, but I can't easily think of what those fixed costs would be. Maybe modern business organizations are more complex, and therefore require more up-front investment in firm-specific human capital? I'm just hand-waving here. The authors consider whether fixed costs have risen in section 3.5. 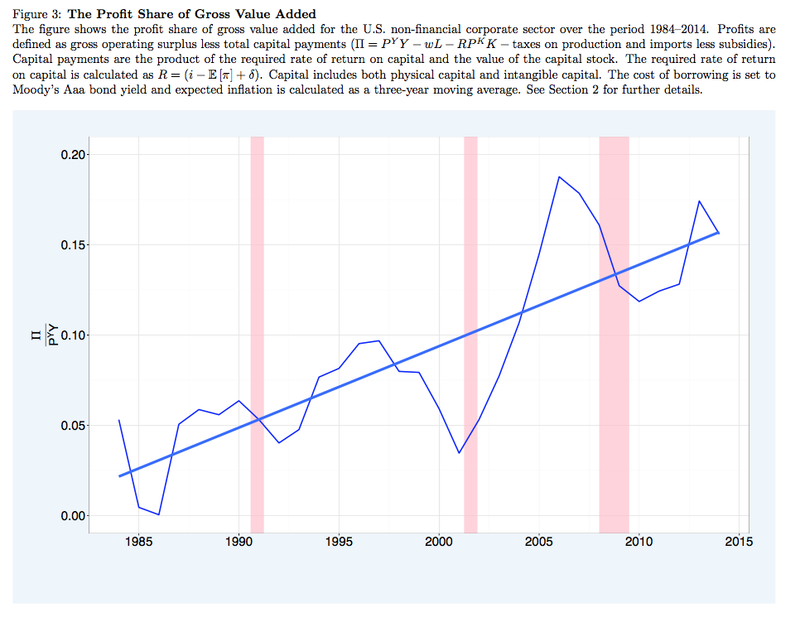 They note that measured corporate profits have increased significantly, but do not consider these revisions to the data. Profits haven’t risen by nearly as much as the unmodified TED series might suggest. 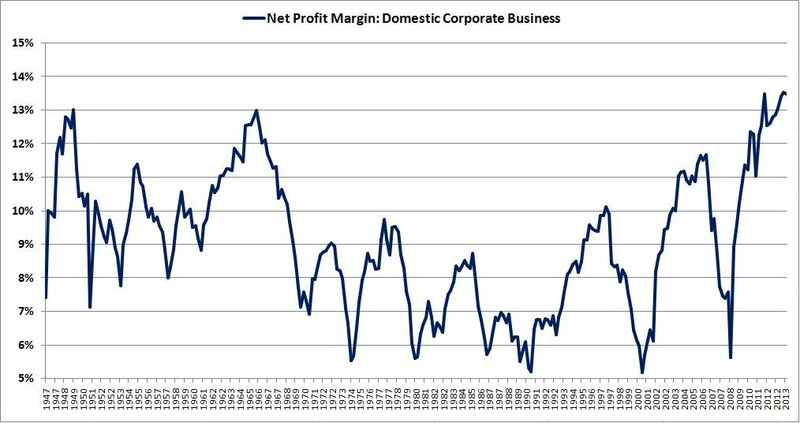 Profit margins are at an all-time high, but not that much higher than in the 50s and 60s. His series tells basically the same story as Livermore's - profits have gone up up up. But he doesn't extend back to the 50s, so it's not clear whether higher capital costs back then would reduce the high profit margins seen on Livermore's graph. Interest rates were similar in the 50s and 60s to what they are now, so it seems likely that Barkai's method would also produce a large-ish profit share back then as well. 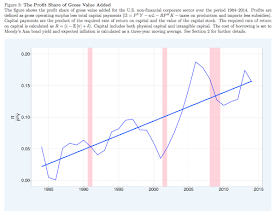 So it does seem clear that profit has gone way up in recent decades. But a full account should say why profit was also high in the 50s and 60s, and whether this too was caused by market power. If this is a rise in fixed costs we're looking at, where's the investment spending? In most areas we have more choice, maybe much more choice, than before...ask yourself a simple question — in how many sectors of the American economy do I, as a consumer, feel that concentration has gone up and real choice has gone down? Hospitals, yes. Cable TV? Sort of, but keep in mind that program quality and choice wasn’t available at all not too long ago. What else There are Dollar Stores, Wal-Mart, Amazon, eBay, and used goods on the internet. Government schools. Hospitals. Government. Did I mention government? Hmm. Autor et al. show that market concentration has increased in basically all broad industrial categories. On one hand, that doesn't take geography and local market power into account - if there's only one store in town, does it matter if it's an indie store or a Wal-Mart? But I think it gives us reliable information that Tyler's anecdotes don't. Also, Tyler is thinking only of consumer sectors. Much of the economy consists of intermediate goods and services - B2B. These could easily be getting more concentrated, even though we don't come into contact with them very often. That said, the example of retail is an interesting one. Autor shows that retail concentration has gone up, but I'm sure people now have more choice of retailers than they used to. I think the distinction between national concentration and local concentration probably matters a lot here. And that means maybe it matters for other industries too. But as for which industries seem more concentrated before, just off the top of my head...let me think. Banks. Airlines (which is why they aren't now all going bankrupt). Pharma. Energy. Consumer nondurables. Food. Semiconductors. Entertainment. Heavy equipment manufacturing. So anecdotally, it does seem like there's a lot of this going on, and it's not just health care and government. 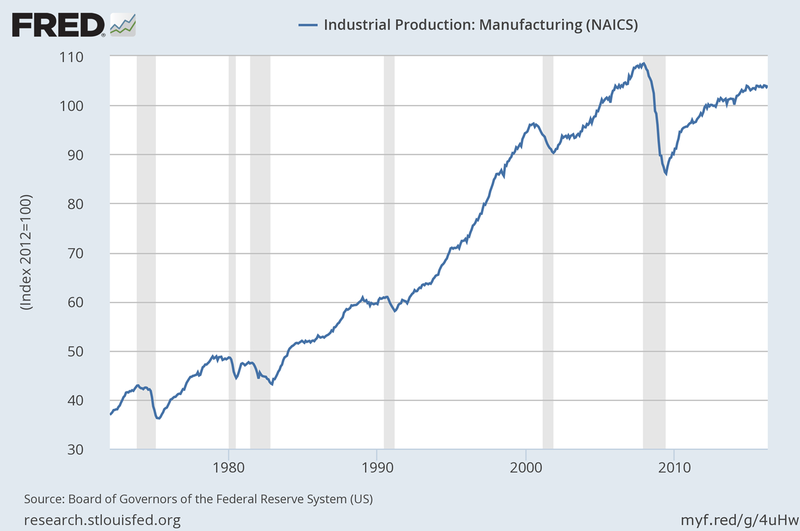 Similarly, the time series for manufacturing output is a pretty straight upward series, especially once you take out the cyclical component. If there is some massive increase in monopoly power, where does the resulting output restriction show up in that data? Once you ask that simple question, the whole story just doesn’t add up. This is an important point. The basic model of monopoly power is that it restricts output. That's where the deadweight loss comes from (and the same for monopolistic competition too). But overall output is going up in most industries. What gives? I think the answer is that it's very hard to know a counterfactual. How many more airline tickets would people be buying if the industry had more competition? How much more broadband would we consume? How many more bottles of shampoo would we buy? How many more miles would we drive? It's hard to know these things. Still, I think this question could and should be addressed with some event studies. Did big mega-mergers change output trends in their industries? That's a research project waiting to be done. So overall, I think that while Tyler raises some interesting and important points, and provides lots of food for thought, he doesn't really derail the Market Power Story. Even more importantly, that story relies on more than just the De Loecker and Eeckhout paper (and dammit, I had to look up the spelling this time!). The Autor et al. paper is important too. So is the Barkai paper. So are many other very interesting papers by credible economists. So is the body of work showing how antitrust enforcement has weakened in the U.S. To really take down the story, either some common problem will have to be found with all of these papers, or each one (and others to come) will have to be debunked independently, or some compelling alternate explanation will have to be found. The Market Power Story is still alive, and still worrying. So, as I see it, the evidence is piling up from a number of sides here. Economists need to investigate the question of whether output has been restricted. But those who want to come up with an alternate story for the recent changes in industrial organization need one that's consistent with the various facts found by these various sleuthing detectives. Robin Hanson and Karl Smith both have posts responding to De Loecker and Eeckhout's paper and attacking the Market Power Story. Both give reasons why they think rising markups indicate monopolistic competition, rather than entry barriers. But both seem to forget that monopolistic competition causes deadweight loss. Just because it has the word "competition" in it does NOT mean that monopolistic competition is efficient. It is not. You can cite the deadweight loss of monopoly all you want, but we’re getting more outputs of other stuff. Value-added could be either higher or lower, productivity too. This seems like a hand-waving argument that economic distortions in one sector are never bad, because they free up resources to be used elsewhere. That's obviously wrong, though. To see this, suppose the government levied a 10000% tax on food. Yes, the labor and capital freed up from the contraction of the food industry would get used elsewhere. NO, overall this outcome would not be good for the economy. Monopoly acts like a tax, so a similar principle applies. No, resource reallocation does not make market distortions efficient. The Schumpeterian tradition, of course, suggested that market power would boost innovation. There are at least two first-order effects pushing in this direction. First, the monopoly has more “free cash” for R&D, and second there is a lower chance of the innovation benefiting competing firms too. I don’t view the “monopoly boosts innovation” hypothesis as confirmed, but it probably has commanded slightly more sympathy from researchers than the opposite point of view. Bell Labs did pretty well. This is actually a good and important point, and I don't think we can dismiss it at all. There are economists who argue monopoly reduces innovation, and others who argue it increases it. [Y]ou must compare [the efficiency loss from monopolistic competition] to the rise in product diversity that follows from monopolistic competition. Does market power increase product diversity? That was certainly Edward H. Chamberlin's theory back in the 1930s. When you start getting technical, the question becomes less clear. But under those same conditions, profits are zero and so the mark-up arguments from the DeLoeker and Eeckhout paper do not apply and indeed cannot hold. That seems incorrect to me. The fact that long-term profits are zero does NOT make monopolistic competition efficient. So the De Loecker and Eeckhout argument can indeed hold, quite easily. This basic fact - the inefficiency of monopolistic competition in standard theory - keeps coming up again and again. It appears to be a key fact the bloggers now rushing to attack the De Loecker and Eeckhout paper have not yet taken into account. Do economists conventionally view rent as a variable expense? Every business plan I've read regards rent as a fixed expense, often explicitly when discussing "organic" growth. Aren't rents simply capitalized property assets/liabilities under a different accounting treatment? Agreed - Rent is a fixed expense from the standpoint that most businesses have multi-year leases they cannot just get out of if a cheaper lease is available (especially retail where the cost to relocate is really expenses....see why when restaurants lose their lease they often just close down than relocate). Basic microeconomic theory describes rent as a fixed cost in the short term. However, in the long term, rent becomes a variable cost. Basic microeconomic theory works with the assumption that rent is fixed in the short term. However, as firms move into the long term, rent becomes a variable cost. Noah, IO economists have been highly skeptical about cross-sectional inter-industry studies purporting to show economy-wide market power for more than 40 years. See Demsetz JLE 1973 and Schmalensee 1988. Concentration/market structure is an output of the competitive process. Markets are heterogeneous on a number of dimensions. If what we really care about is competition (or, alternatively, the presence of market power), cross-sectional studies just aren’t going to tell us very much, regardless of whether they measure concentration, profits, markups, etc. This is why antitrust analysis looks to individual markets. Can you tell me why this new stuff is different in any meaningful way from Bain's work in the 50s, which just isn't followed in IO anymore? Isn't one company's increased fixed costs just another's monopolistic profits? There are many more brands and varieties but many are produced by the same firms. The difference between the 50s and now is producing domestically for export vs foreign for import. Doesn't output restriction show up in limited wage growth, though in output as well after 2000? It can both be true that increased concentration is leading to increased market power, but we are still better off and this output isn't falling. Consider a merger that leads the combined firm to have more market power (giving it an incentive to lower output and raise price), but produces marginal cost efficiencies (giving it an incentive to raise output and lower price) that are more than enough to offset the output effects. That's of course the calculation we try to do in modern antitrust. Repeat that across a broad swath of the economy and you could see labor's share falling even though the absolute accrual to labor is larger -- because it is a smaller percentage but of a significantly larger number. I would also note that various government output restrictions probably are playing a role here too by raising barriers to entry. See occupational licensing, business licensing, current structure of much of environmental and land use law. TALK ABOUT THE DOG THAT DIDN'T BARK. [(Dark hint: think Germany.)] How about the missing market power of labor (unions) to counter monopSONY (one buyer of labor) with monopoly (on seller of labor) -- possibly not allowing monopoly in the consumer market to get really far off the ground in the first place? Need I say more? Here's a quick guide to how labor union density may be rebuilt -- quickly. An aid to getting the logical concept of rebuilding past the midbrain social block that says that if it isn't happening socially now, it can't ever happen. Barrier more psychological than cerebral. In our backward socioeconomic culture we need to make union busting a felony. Quick example: In California, number of registered voters equal to 5% of number who voted last governor's race puts initiative on ballot (immediately on law books if past in Cal) -- or about 3% of registered voters need to sign up. Nationally 45% earn less than what we think min wage should be, $15/hr -- and 45% have lost 33% of income share since late 60s (10-15% lost ground absolutely while per capita income doubled -- 1968 fed min wage $11.45): 45% of Cal voters should be ready to line up around the block to sign anything to get them out of their desperate condition. While I broadly agree with your thesis, I think there could be a different story going on with markups - maybe it's not to do with monopolistic competition but instead that the economy now consists more of industries with very low marginal costs of production, even if the inputs don't go down as investment. For example a coder's salary is not an investment input (in accounting terms) but the marginal cost of distributing software is minimal. I think that would look like a high markup (charging way more than marginal cost) but would actually represent the amortisation of the intangible asset you developed by paying those coders. Just a thought. There is incentive to count all software development as expenses but that's not true. Some software development costs, including coders, are capitalized, i.e. investment. Under current VC model, you invest ginormously (r&d, duds, loss leadership to gain platform status) to gain monopoly profits and Gigacorn status. Monopoly through network and platform effects is the whole game. Granted that's only part of the whole story but a significant part. It is worth pointing out that every businessman wants to be a monopolist (as Adam Smith pointed out). As CurmudgeonlyTroll writes, the official policy of most venture capitalists today is to only invest in would-be monopolies or oligopolies -- and they're pretty successful. Just more evidence. Noah, wouldn't increased monopoly power go hand in hand with increased monopsony power? This would be validated by stagnant wages. I would also expect deadweight loss to show up in terms of lower GDP. What studies are consistent with this? Anonymous is correct for wages. We have evidence of (a) stagnant wages and (b) positions being left unfilled because corporations refuse to raise wages and refuse to spend money on training. These are both signs of monopsony power in hiring (or at least "monopsonistic competition), as we would expect from the Market Power hypothesis. Airlines, cable and banks are interesting examples to think about. If Bank A operated in the northeast and Bank B operated in the southwest, combining the two definitely increased concentration, but there's no competition lost and there are potential significant efficiencies associated with customer now being able to bank in both regions. Basically, that's what's happened in retail banking. It was - I'd argue artificially via fragmented regulation - extraordinarily unconcentrated to the point that practically every town had it's own bank and big towns had lots of them. That's a giant pain if you travel and want to access your money at your own bank. And we're still not at the point of having real nation-wide banks. (Leaving aside that there may be other reasons why big banks are bad). Same with cable. There's no advantage in two adjacent monopolize. Each customer had one choice already. Combining them may raise other issues - especially vertical issues - but it's not going to result in lowered output, typically. And that's why airline deals have been approved too. A flight from Philadelphia to Atlanta to LA is an imperfect substitute for a flight from Philadelphia to LA. For that matter, through in social media/network and other internet searched. The issue (I've got to read the paper but doesn't seem to get discussed on blogs) is network effects. A bank with a lot of retail locations is more valuable to me as a consumer of retail banking (again leaving aside other financial services). A cable service with more subscribers (or at least above some critical scale) is more valuable both to subscribers and content creators. An airline that connects to more places with fewer stops is more valuable to flyers, especially frequent flyers. I don't think we can talk meaningfully about market power in these areas without talking about network effects. We know what to do when market power resulted from accumulated market share or even vertical integration that foreclosures competitors. But applying those remedies when the cause is positive network effects costs consumer and costs society overall in terms of wealth. Ideally, we'd have remedies without those negative side effects, but I haven't seen any proposals. I think the issue is that, in theory, over time, Bank A and Bank B, if unable to merge, would then work to achieve growth and profits by expanding into the other bank's market. I think something to keep in mind with mergers. Executives and Board when considering mergers often are all acting in the self-interest of their own personal wealth. Bonuses, stock, and short-term labor efficiencies can often mean large payout to the executives in the first years after a merger. Most of the skeletons, inefficiencies and "oh sh*t" moments when things fail to arise come after the CEO/CFO who put the merger together have retired and left. So yes, there is no growth generated when Bank A & B merge, but for the executives putting the merger together, they get more short-term compensation than they would slogging through a competitive market reach expansion the old fashioned way. Banking is more complicated than that and the regulatory framework makes that sort of expansion difficult, but sure. But last I looked (it was several years ago, so grain of salt) there was something like 10,000 banks in the U.S. There are plenty of banks left to seek to expand into other markets. And, of course, there were hundreds of other banks in each of our hypothetical merging bank's home markets too. But there are absolutely incentive problems regarding corporate decision-making on mergers. That's a reason to be skeptical about the merging parties' claims about what great things will happen. It doesn't tell us anything about whether the merger will lead to market power, though. Yet again an article to encourage thinking. another theory on the increased mark-ups I think has some weight to it and needs to be investigated is the impact of global trade. Around 1980 is also a point where global trade and competition from the Far East and Latin America really started to increase. As many have noted....firms that outsource production, decrease their marginal costs of production, but do not decrease the sale price at the same rate (or sometime, do not even decrease the sales price at all). Secondly, this also explains the reason why much of the increase occurred by the largest firms within industries. It is much more easy for large firms to outsource production to lower cost labor markets (especially in the early years, when the logistics were more difficult, know-how and experience less, and risks much higher). With the advent of places such as Foxconn, outsourcing has gone form the wild west to a more formalized and easier to navigate process). Accordingly, a small manufacturing firm is less in a position to take the risk and jump to outsource production than a large firm, with resources (both human and capital) to make that jump happen. Finally, those industries which are less likely to be outsourced (Silicon Valley for example), the marginal cost of production is close to zero), and the main driver of costs for those firms are R&D costs. I think a perfect example of this is the bike industry. Bikes are manufactured in China and Taiwan almost exclusively now. Many great brands got gobbled up and disbanded (Klein, Serotta, or the original version of Lemond bikes). However, the cost of buying a road bike now is much more expensive than back in 1980, even after factoring for inflation. Some of this may be technology, but even an entry level, steel or aluminum road bike of similar features is going to cost you close to $1,000.00. Do you really think that monopolistic competition (which is what you get when entry is free, but where firms sell differentiated products -- in other words, the norm for most consumer goods) is a "problem" that demands a policy response?? Really?? Yes, in a Econ 101 textbook sense (BTW I thought I remembered reading posts by you that decry the use of Econ 101 arguments in policy debates ... but intellectual consistency is for little people, I guess)there is a "distortion" by comparison to perfectly competitive homogeneous goods markets, but no sensible person thinks that there is anything policymakers can or should try to do to eliminate this "distortion." This is a pretty lame argument. Oh yes. Most would agree the benefit of product differentiation outweighs the dead weight loss that monopolistic competition causes. First of all, this guy's entire world view I think comes down to having exotic cuisine near his home, and since that is happening, all must be good. Secondly, I am not sure what IT investing his local Chinese restaurant is investing in, but guess what, I can almost guarantee they are not exactly building out an on-site server room or anything that would impact this discussion. I think Noah raises a question that needs to be evaluated in regards to deadweight loss, and it is a concept I worry has some Econ-101ism. Noah asks: how many more shampoo bottles would be purchased. I am going out on a ledge, but the amount of consumer of shampoo left out of the market from lack of money has to be too small to be a policy concern. I think what is the real dead weight loss is more about, what if there were lower prices in a more efficient economy, where would the surplus purchasing power of buyers go? Maybe if airline tickets were cheaper, more people would fly. Perhaps there is some deadweight loss here, but, unlike shampoo, there are actual alternatives (driving, buses, trains) that fill that need. In addition, most people's ability to take trips are limited by time and not money. We see stats all of the time about the need for consumers to go into more and more debt to maintain their lifestyle. So if anything, I think this concentration of firms and monopolistic competition does not necessarily create the deadweight loss, as much as it syphons off resources for consumers to save, or, requires consumers to go into debt (which is far worse). I agree, especially in retail, that up until the late-1990's, for the most part, there was always a limited supply of retail options for any given good in your area. But as we are seeing now, as predicted in the monopolistic competitive economy, a lot of these national retail firms are slowly dying, and leaving only a few large players. In addition, even if local selection in 1975 was less than the national selection available now, the lack of local variability gives a sense of homogeneity that is more pernicious than in the past. Sure, New England had Ames and Rich's department stores in 1985 as the only two main competitors, but there was also Target in the upper Mid-West and Wal-Mart in the South. It felt less concentrated, even if options available at any given time in any given location were maybe a little bit less varied. I think Tyler's point is that you can't simply add up individual distortions sector-by-sector to arrive at a grand total of the distortion. That's not hand-waving is the Lipsey-Lancaster theory of second-best. Tyler's wrong, and he's wrong because monopoly and oligopoly is happening in *most* sectors of the economy. (Actually, off the top of my head, I can't think of a major sector which isn't an oligopoly; it's certainly a majority of the sectors and probably more than 2/3 of the sectors.) It's quite impossible to correct this in the short list of remaining sectors. In my mind, the most important feature of this post is that it showed me that Karl Smith is blogging again. After he left Modeled Behavior, I missed that he started with the Niskanen Center. Thanks! 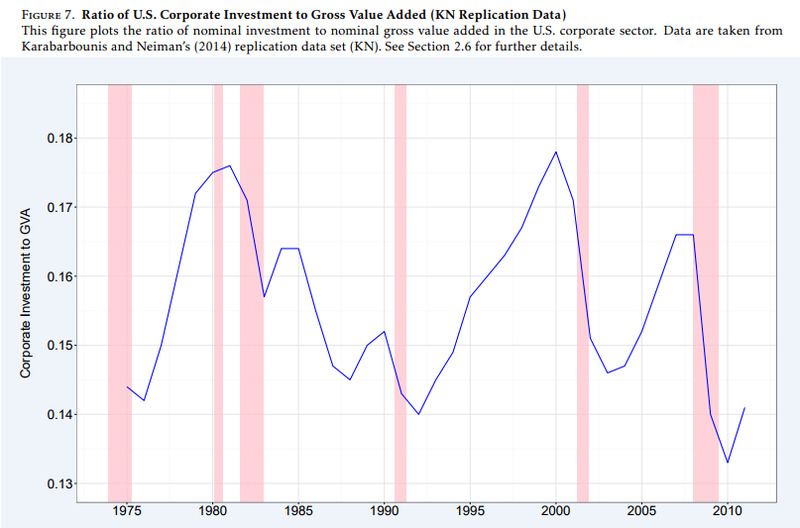 If there has been a greater concentration of the US market that affects the aggregate level of GDP. Why has not this also affected the aggregate level of prices, characteristically low in the last three decades? 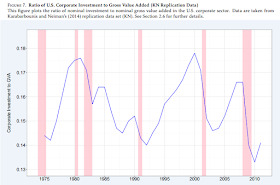 If there has been a greater concentration of the US market that affects the aggregate level of GDP, why has not this also affected the aggregate level of prices characteristically low in the last three decades? No incentive to innovate. Managers get paid to engage in financialization not innovation. Also I agree with Brad Towne as well. Would be interesting to see direct data on spending that increases monopolistic power, e.g. pattern and trade mark, legal enforcement, branding, versus product improvement and innovation, e.g. R&D. Hi, Noah, at least in plausibly calibrated medium/large scale New Keynesian DSGE models you like to pick on sometimes, with the usual monopolistic competition+constant markup with flex prices an increase in markups due to lower competition among producers can significantly lower output: see p. 57 in the model docmentation below and reverse the reported dynamics. Not an economist, not even kinda, but I work in innovation research for the New Economy (tech and software). This involves detailed behavioral observation and subsequent design responses. Increased markups may be the result of better market information...a systematic *underpricing* of lots of goods and experiences can be corrected with modern technology. Not only can you identify the platinum market more reliably--behavior is more reliable than older models such as demographics--it's much much easier to exploit that market using high-tech tools. So it wouldn't surprise me that companies might be irrationally exuberant when they price products, especially new products or disruptive products. My opinion is there's a third option not being considered. The rise in markups seems to match the rise in wealth innequalty. capitalist market pricing theory predicts if you have a larger difference between rich and poor shoppers then you raise your price. There's a big difference between a capitalist market where all your customers have exactly the same amount of money and supply vs a capitalist market where your customers are made of a few very very rich people and a lot of very poor people. Think about what happens as a retailer when you have a customer base of 1000 people who all earn $10/hr and how you price that product. Then think about what happens as a retailer when you havea customer base of 900 people who all earn $1/hr and 100 people who earn $900/hr. How does that change the most profitable price you want put on your price tag to make the most money as a retailer? A smart retailer would incrase the markup whenever innequality increases. And that's what I think is happening mostly, but the other things are probably happening too and the objections and alternatives presented in your link are worth consideration and probably valid as far as I can tell. I just think the natural profit seeking behavior of the retailer in a highly wealth innequality marketplace explains most of the data. You need to read this article. I consider the Market Power theory entirely valid. It's consistent with the notion from Sapped Economy theory that as unit costs of production continue to fall that firms will seek to maximize profits by minimizing marginal costs. I believe that in cases where a firm chooses to limit the availability of a good or service, the reason for that choice may be found in the Microeconomic models of corporate bean-counters. 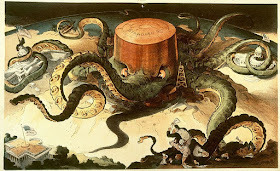 Willfully limiting the availability of a product is only possible when oligopolistic market control, and a generally high degree of informal collusion cemented by common membership in industry think tanks and attendance at conferences, prevents the emergence of price wars that would throw off corporate revenue models.